We are a small group of ODPs’ (operating department practitioners) who maintain & develop perioperativeCPD. We are based in Scotland and our aim is to produce quality, accessible and free CPD for anyone working in the peri-operative environment. perioperativeCPD is used by over 5000 ODPs’ and anaesthetic assistants from over 20 countries every month. It is the number one CPD provider for Operating Department Practitioners in the U.K. and anaesthetic technicians in Australia & New Zealand. It is also an essential resource for expats anaesthetic assistants working in the Middle East. More importantly increasing numbers of practitioners from low resource (previously known as the third world) countries are using the site to update their practice. By visiting this website you have some idea that Continuing Professional Development (CPD) is required by your registering body. It is best that you read what is required for your specific profession as each body will have a guide on their websites. A common theme is that a variety of CPD is needed and that a little more often is a preferred way. The key is recording everything as you do it as it is easy to forget what you have done it a couple of months later. Reflection is also important and a requirement of many registering bodies. There is a reflective template on the site you are free to use. Yes, The costs of running the site are covered by those of us who run the site although we are currently looking for a sponsor to help with this. We are committed to ensuring CPD is not a burden for already hardworking perioperative colleagues. What type of CPD is this? Our CPD comes under either the category of self-directed study or professional study through online learning. Although by adding a reflective piece on why you chose that module and what you have learnt it adds a new dimension and can potentially double the hours you can claim. For more information on what you need see your regulatory bodies website as they all have their own specific requirements. Perioperative CPD are committed to providing free quality education for everyone working in the theatre environment. ODPs, theatre nurses, anaesthetic assistants and technicians, everyone is welcome. Our on-line CPD site enables this with free open access modules for all. We particularly welcome those working in resource low countries. What do you mean by verifiable? Verifiable means that we can prove to your regulatory body which modules were sat by you and when. We are more than happy to do so. This is why it is important that you fill in all details correctly. We keep all pass grades for two years. Yes, we are always looking for help. Have you written an article that you would like to get published? Many of our articles are written by users of the site. You can also be a great help by providing us with feedback/ letting us know how we are doing and by pointing out any errors on the site. Despite our best efforts they do occasionally sneak in. But the best way of all to help is let others know about us. Share away, like our Facebook page, the more people who use the site the more worthwhile it is for us to keep it going. Why are there not more scrub modules? We would love to have more scrub modules but scrub is very speciality based. The needs someone working in neuro are different from someone in orthopaedics. We are working on some more generic modules and will have them up as soon as possible. Why are the tests so hard? We are often asked why the tests are so hard. There are 2 reasons for this. First, it is an open book test. Open book tests are always harder. You can have the module open in front of you when you sit the test. All the questions are based on the modules and there is plenty of time to complete them. Secondly we need to maintain a certain level of difficulty to ensure our own legitimacy. If the tests were too easy then it destroys our reputation as a provider of quality reputable CPD. We think the tests are fair and while some questions may be tricky the answers are all found in the module article. When will there be new modules? We try to release 10-20 modules a year but this can vary as all work is done by volunteers in their own time. How many CPD points are the modules worth? We are often asked this question. 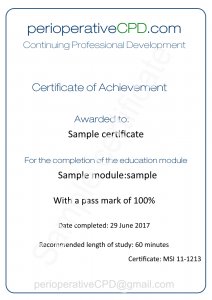 As our modules are used by a large variety of health care professionals in over 20 countries it is not possible to offer CPD points. This is because each registering body has their own standards and what they require to achieve these standards differs between each of them. This is why we use a ‘recommended length of study’ system to identify how much work is required by the typical user. This figure does not include the time taken to write a reflective account of your learning. Why have some articles changed? This is due to copyright issues. The articles are the same but just link to the original source rather than us hosting them ourselves. Reflection is now a necessary part of most CPD programmes. Love it or hate it, it is here to stay. We have a simple reflective template you can fill in that makes this process as simple as possible. Why is it important for me to reflect on my learning? Don’t forget that you also need at 20 of your 35 hours of CPD to have a component of participatory learning. We do not collect any of your information. Your name and email address and results are provided to us by periopCPD who run the tests for us. This is for customer service (in case you have questions regarding your tests) and to enable us to provide verification details in case of a CPD audit by your regulating body. This will only be done with your express permission. Why did I not get a certificate? Certificates are only awarded if you get a pass mark of over 80%. These are then emailed to you. It is essential that your email address is entered correctly.